A suitable theme for Blog, Magazine and News Sites. Use WeblogPro theme with masonry layout and feel the best experience in the web worlds. Extract weblogpro.zip and weblogpro-child.zip and upload the both folder. One click demo import is available on WeblogPro. Caution: Importing demo content will lost the previous contents, make sure the previous contents are important or not. Adding a new post is the same way as default WordPress installations, however, there are extra options that might need explaining. 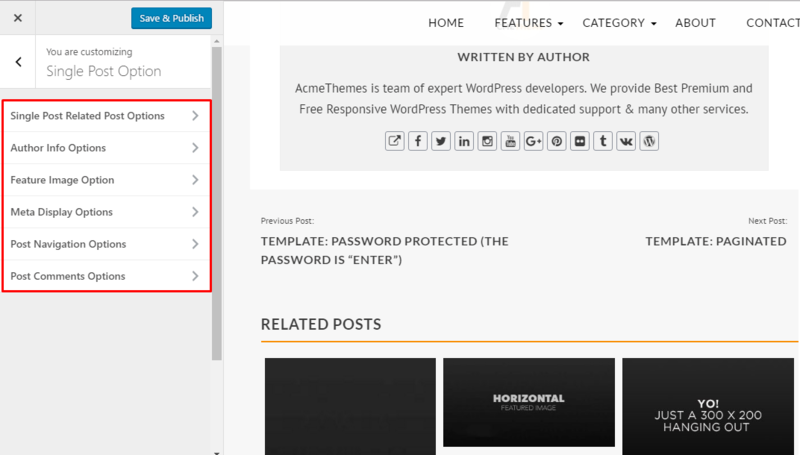 This theme is specially build for blog purpose. Usually each blog post have content and featured image. Featured image will display on front page, in single page. How to Increase the number of Post on Home Page ? How to add “Logo” of the theme ? If preview is fine, Click on Save & Publish button to save the change. How to Enable Slider ? Checked on Enable Feature Section to enable slider. You can change everything related to slider are controlled from here. You can control the carousel slider from here. Checked on Enable Feature col Section to enable slider. In this section you will find all the options related to theme header. Use the available options to manage the header section. Checked on “Show Date and Time” to enable date and unchecked to hide it. Click on Save & Publish button to save the change. Checked on “Enable Sticky Menu” to enable sticky menu. Social icons and link can be manage from this section. Please follow the below steps to manage this section. You can Add image or Adsense code here to add the Advertisement on your site. This theme is Adsense ready. Besides this, you can add the Advertisement on between Content, on sidebars, footers etc. You can also use your google Ad Sense code here. Checked Enable Another Search Type to change the layout of search. Checked on Show Trend Menu to show. You will get all the options related to footer section here. Go to Appearance > Customize > Footer Options to customize the footer section. You will able to change Copyright Text from there. You will enable/disable form Enable go to top check box. Checked on Enable Social In Footer to enable social icons on footer. You will enable/disable Enable Theme Name and Powered by Text. If you add your own text on Your Own Powered By Text field, your own powered by text will appear in place of theme powered by text. Very flexible options for changing you site layout, design and colors. You can manage Single Page, Archive Pages, Default Sidebar, Default Related Posts, Sticky sidebar etc from this section. Use the available options to customize your site layout. How to add / remove intro Intro Loader Middle Image ? From customize go to Layout/Design options > Intro Loader Options. Select the image for intro loader. 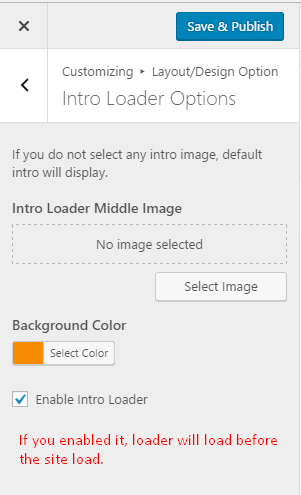 Select the background color for intro loader section. Check to enable and unchecked to disable the intro loader. Click on Save & Publish button to save the changes. Select the options from the dropdown. From Customize, go to Layout/Design Option then Button Design. Select the Button Design Rounded or Rectangle. All the button with the site will changed accordingly. From Customize, go to Layout/Design Option then Enable Post Format. Checked on Enable Post Format to enable it. From Customize, go to Layout/Design Option then Default sidebar layout. Select the available options from the drop down. 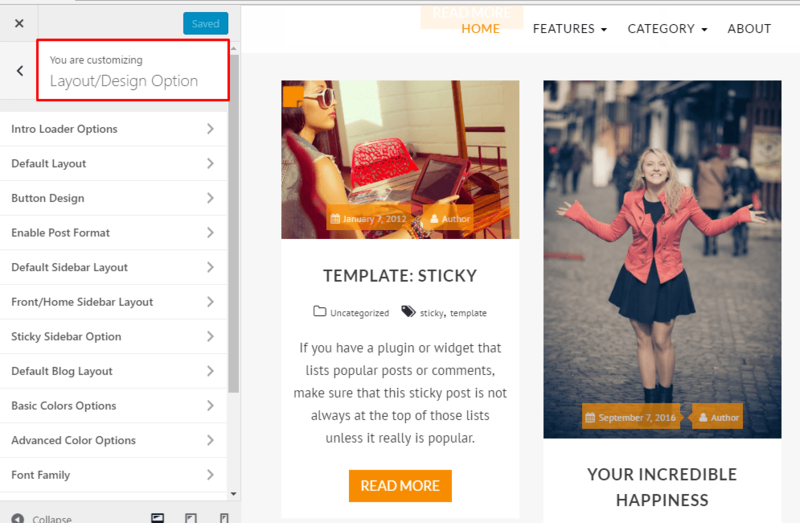 If you want to change the layout of individual page/post, you will get options inside the individual page and post. How to Override Default Sidebar From the Individual Post/Page ? Click on Publish button to publish the change. From Customize, go to Layout/Design Option then Sticky Sidebar Option. 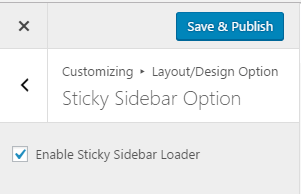 Checked on Enable Sticky Sidebar Loader to make the sidebar sticky. How to manage Home/Blog page section ? 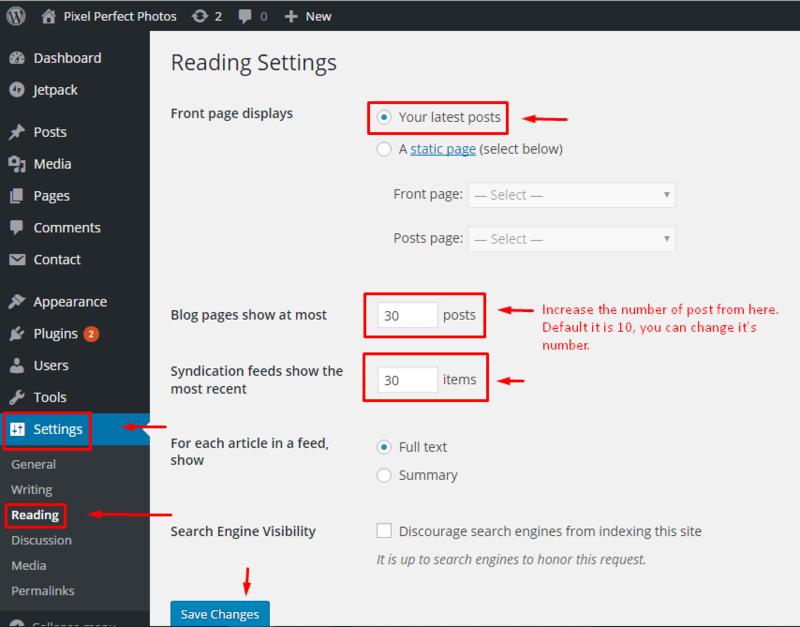 From this section, you can easily change the setting of home page and blog page. It includes image size, Blog Column Options, Text Align Options, Description in Length, Change Read More text, Exclude Categories In Blog Page, Enable/Disable date, Enable/Disable author etc. 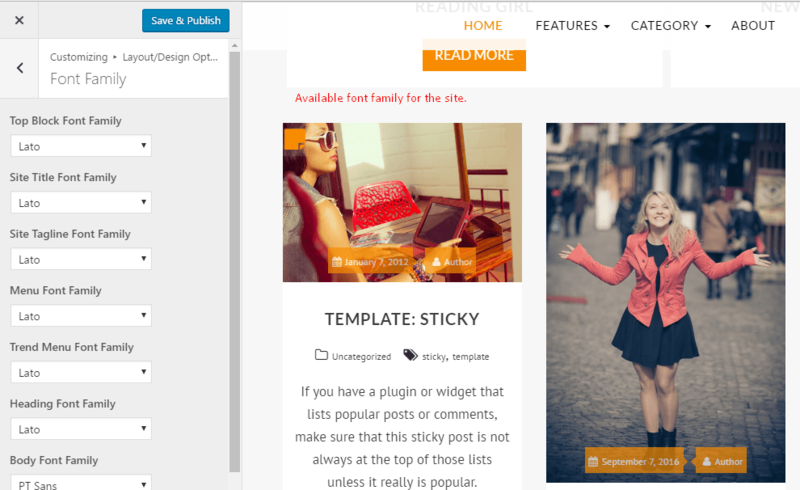 From Customize, go to Layout/Design Option then Default Blog Layout. Select the available options on Image Layout Options. It will hide that category on Blog page and Home Page. How to show/hide date, comment, tags etc on Home/Blog Page ? You will get the check box to show hide the respected sections on home/blog page. In the pro version, you have Basic color options and Advanced Color Options to manage the Site Color. From Customize, go to Layout/Design Option then Basic Color Options. Select the available color as your need. You can change Background color, Site Title and Tagline Color, Hover Color, Heading color, Primary color and more. From Customize, go to Layout/Design Option then Advanced Color Options. More Color options are available here. Choose the color as your need. How to manage the font’s family? From Customize, go to Layout/Design Option then Font Family. You will find the various options for managing font’s family. Every sections font’s can be managed from this section. How to add Background Image? 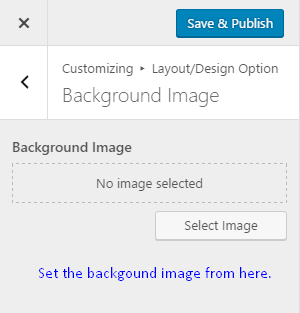 From Customize, go to Layout/Design Option then Background Image. Select the Image from the media library or upload from the drive. Where to write the Custom CSS? 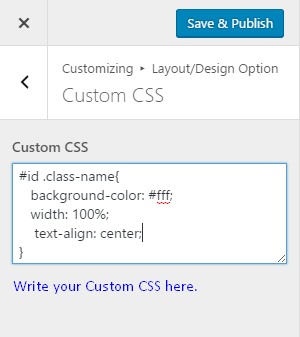 From Customize, go to Layout/Design Option then Custom CSS. Write your own custom CSS here. From Customize, go to Single Post Options > Single Post Related Post Options. Select the available options or manage the options for managing related posts on single post. You can Show/Hide related posts. Your Own Related Posts title. Number of Columns on Related Posts. Show/Hide Date, Comments, Category, Author and Image. You can also manage the number of words in the content of the related post. From Customize, go to Single Post Options > Author Info Options. Check to show and unchecked to hide the Show Author Info on single post. How to Manage Featured Image on Single Post ? From Customize, go to Single Post Options > Feature Image Option. Select the available options from the dropdown. Different Options are available there. 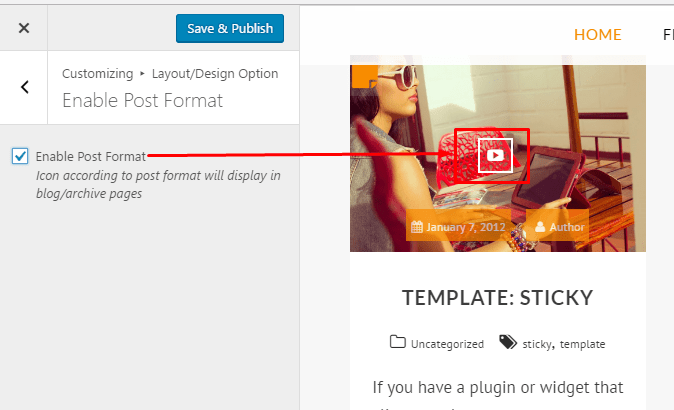 You can easily override the featured image on individual page from Single Page/Post. If preview is fine, click on Save & Publish button to save the changes. How to manage meta on Single Post ? From Customize, go to Single Post Options > Meta Display Option. You can easily Show/Hide Date, Category, Author, Tags. How to manage post navigation options? From Customize, go to Single Post Options > Post Navigation Options. Select the available options for Navigation. (Default, Title and Image and Image) are the available options. How to manage Post comment Options? From Customize, go to Single Post Options > Post comments Options. Use available options for managing this section. Theme options include Breadcrumb Options, Pagination Options, Search Placeholder Options etc. From Customize, go to Theme Options > Breadcrumb Options. You can select the available options from dropdown for breadcrumb. How to change the Author description layout ? From Customize, go to Extra Options > Author Archive Options. How to change search placeholder? Enter the text for search placeholder. How to make ajax Pagination / Auto Load Pagination and Default Pagination? Select the Ajax Loading or Auto Loading or Numeric or Default from dropdown. You can change the text of Load More and No More as well. How to reset Color and Fonts? From Customize, go to Reset Options. Select for resetting Color or Fonts. 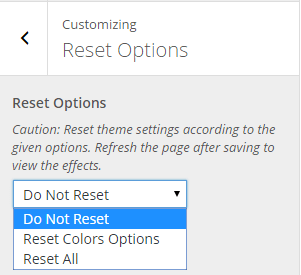 Caution: Reset theme settings according to the given options. Refresh the page after saving to view the effects. There are several widgets available in the theme. All the available widgets are easy to operate and helps to build your site easily. Drag and Drop or simply click to add the Widget on widget area. SuperNewsPro have Main(Right) Sidebar, Left Sidebar Area, Footer column one, Footer column two, Footer column three , footer column four. You can set the available widget on the available widget area. This widget help you to add the advertisement image, title, code, and link. Use can use the available options for managing advertisement on the specific widget area. You can add the Adsense code as well. This widget is used for managing the author with author details, image etc. This widget helps to show the post from category. You can give the title and select the category to display on the widget area. This widget helps to show the popular post from category. You can give the title and select the category to display on the widget area. This widget will help to make the post slider and can placed on required sidebar area. In At Tabbed widget, Popular Post, Recent Post and Comment can be placed and every section of it can be managed easily. There are other widgets as well which help to manage the site awesome. 2. Home Page with One Column layout and right sidebar. You can change the sidebar on left side as well. 3. Both Sidebar Layout. Home page with both sidebar and one column post. 4. Small image on the left side layout. You can change the layout on left sidebar, both sidebar as well. 5. Full width one column without sidebars. You can make the layout with sidebars as well. If you have any query, please post your query on Support forum.